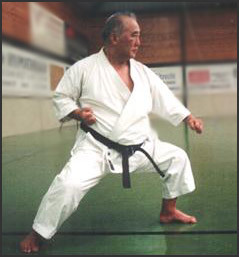 Okuyama Tadao Matsumura Sokon - Azato Yasutsune - Funakoshi Gichin - Funakoshi Yoshitaka - Kase Taiji. Hironishi and Okuyama were two notable influences on Kase-Ha. Modifications of style: improvement of open-handed techniques and use of kicking. Main improvement: teaching of the way.